We have one aim…… TO IMPROVE YOUR GAME !! We offer all types of tuition from 1 to 1 sessions to group sessions. 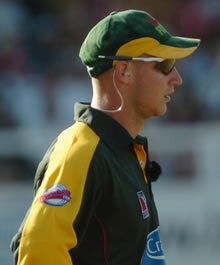 For a full range of cricket coaching for beginners and professionals we have it covered. Sessions range from learning the basics of batting, bowling, fielding and wicket keeping, to learning and developing more advanced techniques and tactical awareness of the game. All courses are managed by John Sadler. John is an ex-professional cricketer who had a 12 year Professional career playing for Yorkshire, Leicestershire and Derbyshire County Cricket Clubs. He scored over 5000 runs in 223 appearances including 4 centuries and won two T20 Cup finals. John is an ECB Level 4 qualified coach, one of only a handful in the country. In February 2014, John took up the full time post of Elite Batting Coach at Derbyshire CCC. "After playing professionally for 12 years, having success in all formats of the game and with experience of playing cricket all over the world, it is great to be able to pass on my knowledge and expertise to the next generation of aspiring young cricketers." John is based at Ossett Cricket Club but is also available to travel to any venue to deliver or assist with coaching. Details about the many types of coaching and to view the up to date calendar are available by clicking the links.